As Hurricane Joaquin moves away from the Bahamas there are still cruise ships with altered itineraries and there could be even more as the strong storm heads north. At the moment Joaquin has maximum sustained winds of 125 MPH and is moving Northeast at around 13 MPH. As the Hurricane moves north it will weaken but can still continue to cause major damage to ships and the coastline. Cruise ships calling at Bermuda may be affected and with several popular cruise ports along the North American east coast cruise lines are keeping a close eye on developments. Cruise Hive has been providing constant updates on Joaquin in previous reports and here are the latest cruise ships that have adjusted itineraries. Carnival Sunshine is one the most recent vessels to alter its itinerary. The ships chartered cruise to Bermuda will no longer be able to continue so as a result the ship will sail an Eastern Caribbean cruise including calls at San Juan, St. Thomas, and Grand Turk. Carnival has posted that “guests will receive a 25% cruise discount on their next 2-8 day Carnival cruise”. Carnival cruise line has not made any other changes but that could change in the coming days. Royal Caribbean has changed the itinerary for Liberty of the Seas. The ship’s scheduled call at Kings Wharf, Bermuda on October 5 will no longer take place. The vessel will sail to St. John, Canada instead. Royal Caribbean has stated “the safety of our guests and crew is always our foremost concern”. NCL have adjusted the itinerary for the Norwegian Sky. The ships cruise from Miami on October 2 will no longer call at Great Stirrup Cay on Sunday. Instead, the ship will remain at sea on Saturday and call in Nassau on Sunday morning. Watches and alerts for the Bahamas are now over but there is a Hurricane watch for Bermuda. 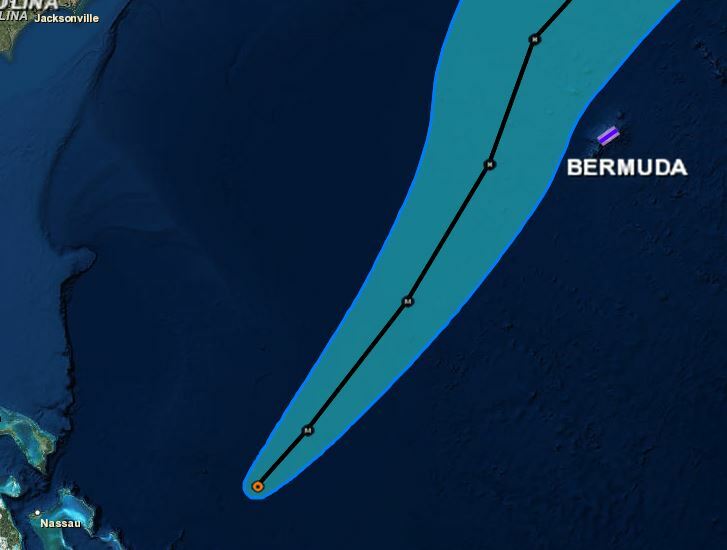 Hurricane Joaquin is over a thousand miles away from the popular cruise destination and the National Hurricane Center in Miami has posted that the storm is expected to pass west of Bermuda on Sunday. Cruise hive will keep readers updated and to keep a track of Hurricane Joaquin you take a look at our Hurricane Tracker.